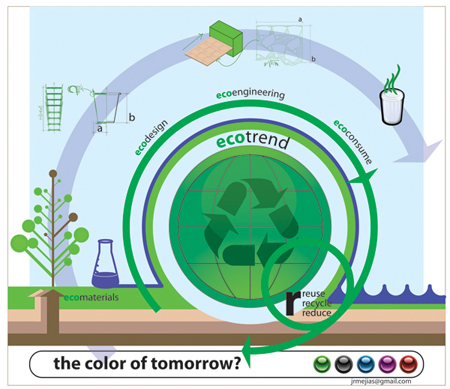 Eye of the eco-storm (TUDELTA.31) | J. Ricardo Mejía S.
Life cycle of a paper cup: designers yearn to develop stunning, lovely-to-use products; engineers want products that are simple to produce and distribute; and users desire a good standard of living, enjoying their freedoms in a comfortable world. A simple paper cup is an extremely complex ecosystem that combines all these desires. Helping to saving our eco-system is however a daunting but necessary task for designers, engineers and users, if there is to be water for future generations to drink in whatever kind of cup – paper, glass or plastic. This illustration and the caption were published on the Newspaper TUDELTA number 31.